One of the stand-out gardens at this year’s RHS Chelsea Flower Show appeared to replicate the pea in its structure. ‘The Seedlip Garden’ had a circular pool, round stepping stones, and a ‘Peavillion’ housing a collection of articles about peas. This garden got me thinking about, well, peas, and the little-observed role they’ve played in our culture. 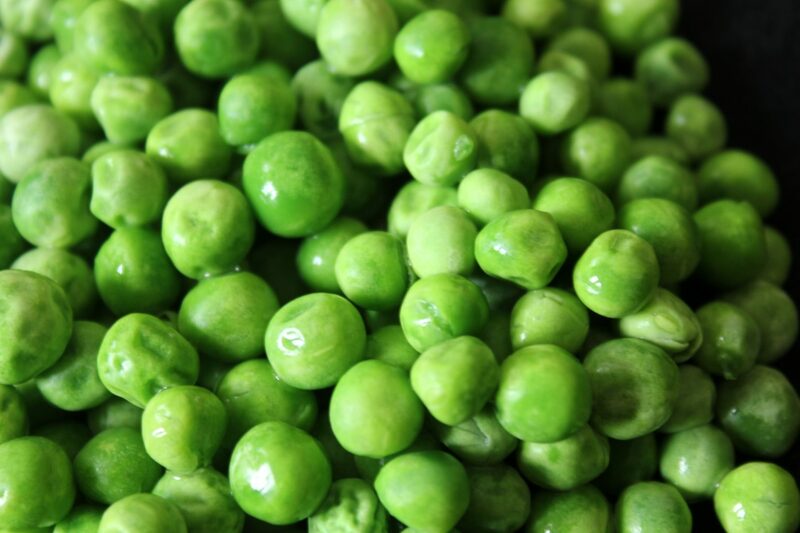 One of the most historic vegetables, the pea probably originated in Asia and was grown as far back as 7000 BC. The Greeks had ‘pisoi’ and the Romans introduced ‘pisum’ to Europe. Peas were widely used in Roman cookery: there are nine dishes which call for peas in Apicius’ fifth-century Roman cookery book. But it is Catherine de Medici we must thank for rekindling a popular affection for peas in the sixteenth century. When she married Henri II of France in 1533, she is said to have brought her favourite foods from Italy with her to France. These included peas, or ‘piselli novelli’. Dried peas soon fell from favour and everyone began to eat petit pois. Garden peas may also have been introduced to Britain through a royal connection: Charles II would have known petit pois during his exile in France and their appearance in British kitchens post-date the Restoration. Indeed, such was the pea’s continued prevalence in France that King Louis XIV is recorded to have observed that: “The young princes want to eat nothing but peas!” And neither, it seems, did he. Petit pois were his obsession. The pea has also played a pivotal role in science. Gregor Mendel, an Augustinian monk, discovered the laws of genetic inheritance by crossing yellow peas with wrinkled peas in his garden in Moravia and experimented on more than 28,000 pea plants over seven years. His results were published in 1866 and laid the foundations for our understanding of genes and the way they are inherited (he coined the terms ‘recessive’ and ‘dominant’). Just before that, and on the other side of the world, US President Thomas Jefferson was busy with his own, non-scientific experiment with peas: he regularly competed with his neighbours to grow the first crop. He decided to stagger his planting so that he would be able to enjoy 15 different varieties of fresh peas from May until July. Shelling peas, in contrast, is the tender subject of paintings and sketches by Whistler and Van Gogh. The Mannerist painter Giuseppe Arcimboldo used peas in his famous vegetable portraits of people; his work ‘Rudolf II as Vertumnus’ has peas in a curved pod serving as eyebrows. Incidentally, should peas pop up in conversation, a lexicographer will probably tell you that a pea (the use of the word has been recorded from 1666) is an example of a back-formation (‘a word that is formed from an existing word which looks as though it is a derivative, typically by removal of a suffix.’) of the older word ‘pease’ which also meant ‘a pea’ but was understood to be the plural. When John Lyly penned the phrase ‘as lyke as one pease is to an other’ in a novel in 1580 he probably did not predict that it would still be widely used today in the form of of the favourite expression: ‘like two peas in a pod’. Chasing the last few peas around the plate is enough to make anyone feel pea-brained, but perhaps reflecting on their history can make the process slightly less maddening.